Spend Summer on the Mountain! Looking to provide your child with a memorable experience this summer? 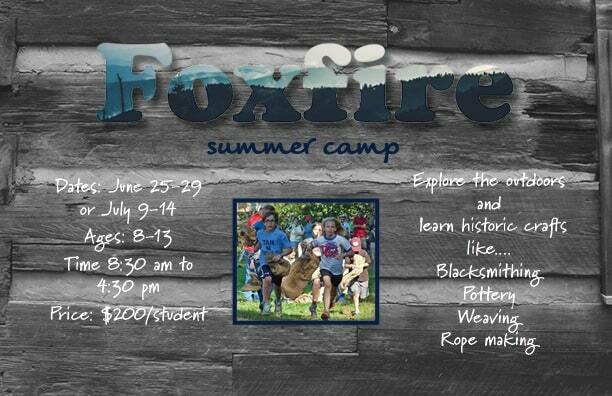 We are excited to announce that we will be offering two, week-long camp sessions this summer at Foxfire! Let your child experience life in the mountains and Appalachian traditions. Each session will feature numerous activities rooted in folkways and nature. Your child will learn various heritage skills, like butter churning, weaving, spinning, blacksmithing, primitive shelter building, chair bottoming, open-hearth cooking, storytelling, gardening, and so much more. All materials for these crafts will be provided and students will be able to take home whatever they make at camp! Each day will consist of a morning session dedicated to a particular craft(s) and an afternoon session of fun-filled games, stories, and exploratory walks around the Foxfire property. While students are required to provide their own meals, they will picnic with other students and enjoy some of the great shady spots on the mountain. Foxfire is situated on roughly 110 acres, and now has an interpretive trail connecting to Black Rock Mountain State Park, which includes three mountain springs with waterfalls. Students will have the chance to explore these features and learn about mountain ecology and local habitats. On these hikes, students might see several species of birds, find salamanders in their cool homes, or collect native wildflowers. Encourage your child to unplug this summer and engage in hands-on activities; it’s sure to be a learning experience they’ll never forget! Registration form is available below. Registration is open until 10 days before the beginning the session. Tuition assistance is available based on income and need. Please contact asstcurator@foxfire.org for more details.